I woke up way, way too early on the 20th. At the latest, it was around four o'clock. I tried to lie in bed, very still, pretending to sleep, but eventually I got sick of it and got up. I would repeat this pattern every day for the rest of my trip. I did morning stuff and spent some time reviewing my plans for the next few days. Eventually, breakfast was available and I went to eat some. I ate a lot of breakfast, especially okayu. Okayu is the Japanese version of congee, rice porridge. It's what you give people who are sick or, apparently, heavily jetlagged. I ate a lot of it while in Japan, usually with a big helping of kelp. It was probably the best new breakfast food I've had in a long time. The only problem I had with it was the labeling. The okayu was in a big serving vessel labeled "gruel." I sent a polite email to the hotel explaining that only prisoners and Victorian-era orphans eat gruel, and to my great delight, they replied that they would change the label immediately. My plan for the day was to get a day out on the town, doing stuff and keeping busy in an attempt to adjust my body clock. My body clock did not get adjusted, but I had a good time, anyway. I met up with Marty and Karen for lunch at Joël Robuchon's L'Atelier, where I'd failed to get lunch on my last trip to Tokyo. It was excellent. Marty cautioned me that theirs was not the best foie gras available in Tokyo, but I ordered it anyway, mostly because I am a risotto lover. I had a great meal! At this point, I was absolutely stuffed. I'd had a big breakfast followed by a three course lunch. Karen said, "Well, I was going to suggest ice cream, but…" and I said, "let's do it!" We went to Snow Picnic, a liquid-nitrogen-using ice cream joint in Nakano. Karen and I had tried to go to National Geographic Travel's "second best place in in the world to get ice cream" in 2013, but found it closed for good, so she'd looked up where to go instead on this trip. We were both excited for it… but then we found that Snow Picnic was closed for vacation! Instead, we went to Daily Chikyo, a funny little soft service place in the basement of a shopping arcade. It was good, especially because it was so hot and humid. Speaking of the heat and humidity, I should mention the vending machines. Everybody jokes about the many weird vending machines in Tokyo, but what I don't think people realize is how many there are. You can't walk more than a block without seeing one (and probably more) in most places. Some of them have soda, and some have water, but they all have tea, weird fruit drinks, and some kind of sports drink. The sports drinks (labeled "ion drinks") are a lot like Gatorade, but seem to come only in one flavor ("white") and have almost no sugar. I drank enormous amounts of Pocari Sweat, the most common sports drink around. It was so hot and gross that I could feel myself dehydrating all the time, and the vending machines of Japan were my constant ally in the fight against heat stroke. We looked at a lot of little shops at Nakano Broadway, where Karen found some post cards and I wisely decided against buying a ¥18,000 Batman statue. We went to Book Off, a huge bookstore. Finally, we ended up at Tokyu Hands. I've heard a lot of people tell me how I should really go to Akihabara on my trips to Japan. It's a huge center for electronics and other of-interest-to-geeks stuff. I've gone, and it's cool. I think in general I find Tokyu Hands much more fun, though. It's like a giant combination of A.C. Moore and Staples, plus a bunch of other random stuff. 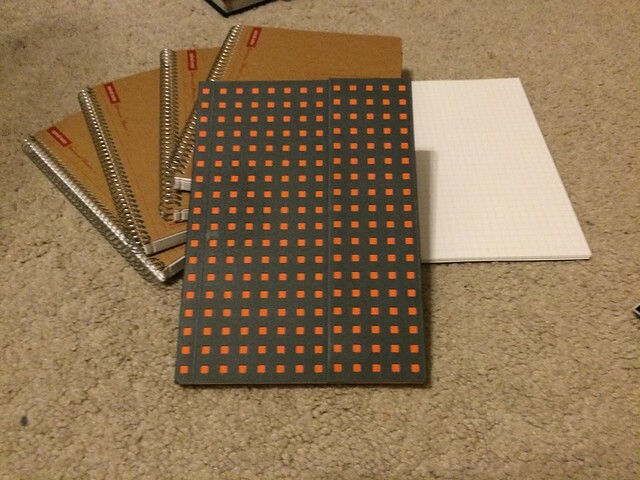 I treated myself to some nice notebooks. Around five, Karen had to get back home. I got myself back to the hotel, did a little reading, and called home. Through an extreme effort of will I managed to stay up until eight o'clock, but that was that, and I fell asleep. I realized, that night, that the reason I'd managed to get onto Tokyo time in the past was that I was staying with Marty and Karen, and would stay up late every night chatting. If I find myself headed back to Tokyo again, sometimes, I'll have to make sure I've got evening plans at some kind of venue where it would be rude to fall asleep. It was good to get to sleep, anyway, and the next morning I'd be up early (too early) to get down to Ariake for YAPC!